Good news for Utah County home buyers. Utah county has recorded its ninth straight month of home sales increases. While we are not back to where we were before 2008 it looks like we are headed in the right direction. 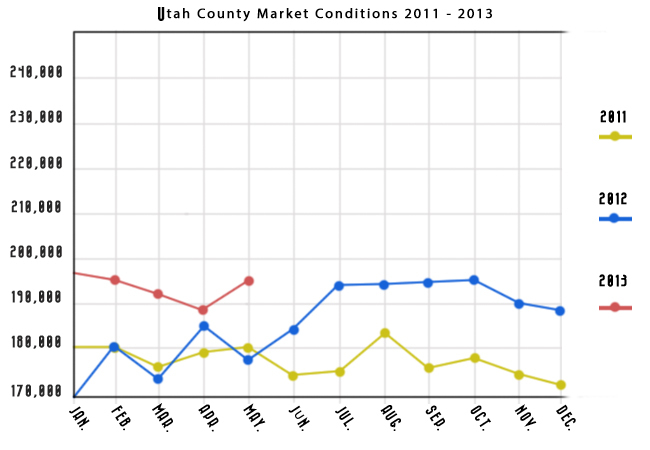 In 2011, the market stayed fairly consistent with the median price of homes in Utah County between $170,000 and $180,000. 2012 did not start off well with median home prices dropping to $164,000 but quickly rebounded ending the year at nearly $195,000. We are about a quarter of the way through 2013 and the median home price has been stabilizing in that range but there are signs that those prices will continue to go up. There is still a ways to go until we will reach the levels we were at in 2007 but there are a few indicators that we are headed in that direction. In 2012, Realtors sold over 500 more homes than they had in the previous January and February which is a 13 percent increase. Inventory of available homes also dropped sharply down about 25 percent from 2011. A 10.4 month inventory is now down to 7 months. This has not been seen since 2007. Below you will find a graph with home sale prices for the last three years. Based on trends and these numbers it looks like we are headed for a recovery in the Utah County housing market. What does this mean for home buyers? Now is the time to buy. Indications are home prices will continue to go up so if you are looking to buy a home you won’t want to wait. Demand and competition for these home will also continue to increase which will drive home values up even more. This is good news for the market but maybe not so good news for you. If you are planning on settling down in Utah County, you can begin your home search by visiting utahhomesforsale.com/utah-county. Whether you want to live in populated cites and suburbs or in a small country town, Utah County has everything. Don’t wait. Start searching for your new home today.